Best management practices that optimise N fertiliser use efficiency under relative high and low yielding potentials is still an area of great debate. On many occasions if the season warrants, top up applications of N provides a further yield benefit compared to basal applications. The most appropriate timing of N application post emergence can vary with the climatic year and yield potentials as well as the product of N used. Within the literature there is a lack of N product comparisons in terms of efficiencies in increasing grain yields. Hi-Tech Ag have two N Products in BLU N and Carbon NS (USC) which has the potential to be an efficient source of N applied in-season. This trial design and assessments allowed for the determination of the effectiveness of BLU N and Carbon NS as a post emergent application of N compared to standard commercial products of Urea and UAN. Three application rates over at least one timing, season permitting (GS30) will determine optimal N rates. 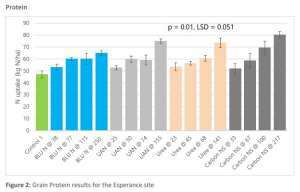 There were 4 Replicates of each treatment. The same trial was undertaken at other sites. Seasonal conditions did not enable us to achieve any statistically significant data to report. All trials were designed by Agronomy Solutions which allowed for maximum statistical power in the analysis. Trials were randomised in a complete block design. The SEARS group were responsible for sowing, general maintenance and harvesting the trials at Esperance. 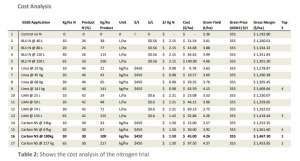 The trial had a basal application of 50 kg/ha of DAP, = 11 kg P/ha and 9 kg N/ha. N treatments were applied at GS30. Significant increases in grain yield (t/ha) to N applications occurred at Esperance and there were no consistent differences between N treatments at each N rate. The only noticeable difference was that Carbon NS out performed Urea and UAN when applied at 30 kg N/ha. 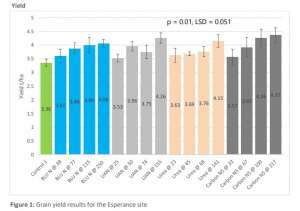 Relative yields (control (0N)/maximum yield*100) was highest with urea, UAN, Carbon NS due to the linear nature of the response curves which resulted in higher optimal N rates (>60 kg N/ha) compared to BLU N products (41-47 kg N/ha). After a late start the season finished off well and resulted in yields pushing 4.4 t/ha. Throughout the season there was responses to N applications which translated to grain responses thanks to a soft season finish. Significant increases in grain yield (t/ha) to N applications occurred at Esperance and there were no consistent differences between N treatments at each N rate. The only noticeable difference was that Carbon NS out performed Urea and UAN when applied at 30 kg N/ha. 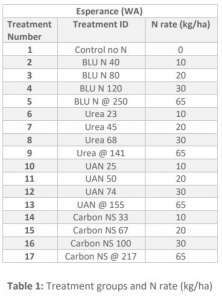 Relative yields (control (0N)/maximum yield*100) was highest with urea, UAN and Carbon NS due to the linear nature of the response curves which resulted in higher optimal N rates (>60 kg N/ha) compared to BLU N products (41-47 kg N/ha). With the grain quality data determination of N uptake in the grain showed that the Carbon NS product was quite efficient in terms of delivering N to the wheat crop. 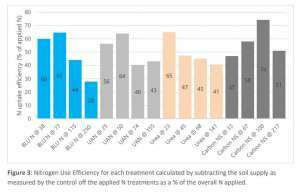 Calculating Nitrogen Use Efficiency (NUE) showed efficiencies were quite high with the highest result of 74% using Carbon NS at 30 kg N/ha. Efficiencies for higher application rates decreased. 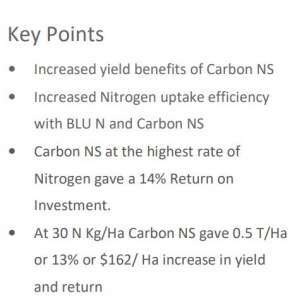 The highest gross margin return was for the Carbon NS product applied at 65 kg N/ha. Note: All trials were conducted by independent contractors and data was collated and statistically reviewed by Agronomy Solutions.